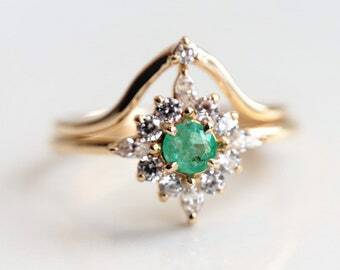 ✤ This listing is for the Lily diamond band only, the Lily Opal and Aquamarine ring are not included. 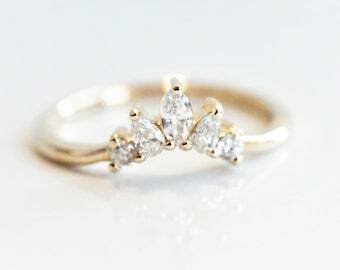 ★Ring Setting：This ring can be made in Sterling Silver, YELLOW, ROSE or Unplated WHITE 14K gold >> please select your preferred material in the listing options. 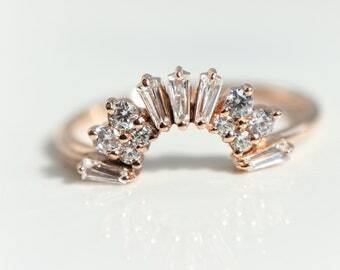 It's ROSE GOLD in photographs. **NOTE for the WHITE GOLD option for this design >> I do not put rhodium plating over the gold to make it look whiter, I keep the original color of the natural white gold. Therefore, it appears rather yellowish or grayish than purely white. This gives it a natural and unique look. 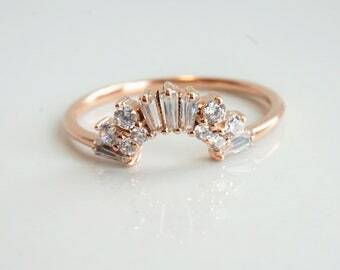 Also, you would not have to re-plate it as you would with most white gold jewelry. Diamond is a 60th Anniversary gemstone and a precious gemstone. A symbol of purity, Diamond’s pure white light helps to bring our lives into a cohesive whole. It brings love and clarity into partnerships, bonding relationships. 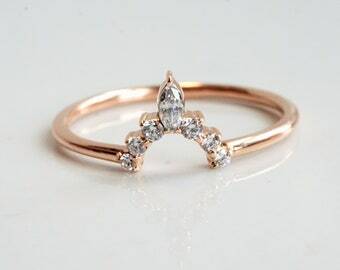 Diamond is a sign of commitment and fidelity and instills trust in relationships and situations. It inspires the forces of accumulation, attracting the manifestation of abundance. Diamond is an energy amplifier. It is a stone that never requires recharging. It will bring strength and endurance to all energies and will enhance the power of other crystals. However, beware, as this means it will increase negative energy as well as positive! Excellent for blocking electromagnetic stress and for protection against cell phone emanations. 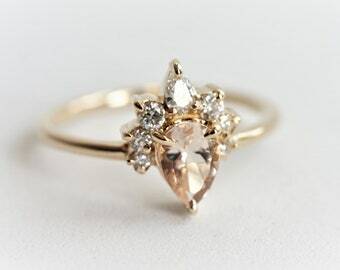 Diamond imparts fearlessness, invincibility, and fortitude. It clears emotional and mental pain, reducing fear and bringing about new beginnings. Stimulates creativity, inventiveness, imagination, and ingenuity. It brings clarity of mind and aids enlightenment. Diamond allows the soul light to shine out. It aids spiritual evolution and reminds you of your soul’s aspirations. Dog for size! 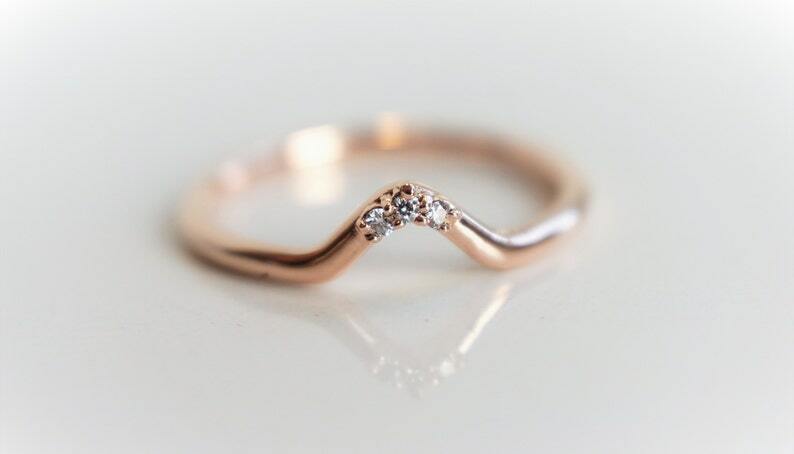 :) This ring is gorgeous. I love the band and the height. I was worried that it would be too big but its not and I was also worried it would get caught on things but it never does! It is a great fit and beautiful color. (gold band) Emi was super helpful and friendly and everything arrived in nice packaging. 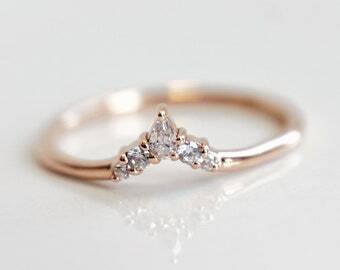 This band is gorgeous and so dainty! I bought it to go with my other ring from Emi, it's my wedding band. 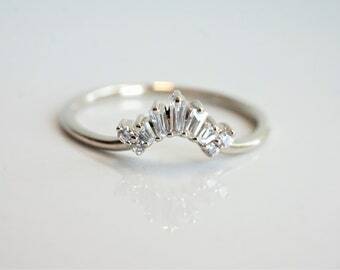 It fits perfectly with my engagement ring and can be worn on top or bottom or even by itself or with other rings. Very pretty and versatile! It's a beautiful ring. Very well made.